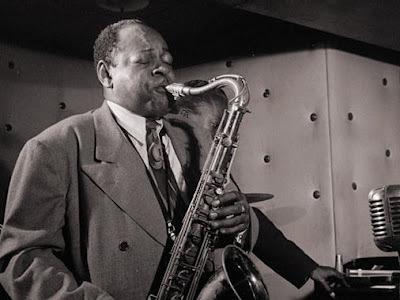 Bob: While reading the liner notes to the excellent double cd of "Coleman Hawkins: A Retrospective: 1929-1963" (RCA Bluebird 1995), I was surprised to discover that Bean played cello and loved Pablo Casals. Since I owe my appreciation of both Bach and Casals to OAOP, I thought I'd send you the following. "In the late Twenties, Casals had begun to record some of the Bach solo pieces as well as a great variety of other material, from lightweight to esoteric. You can hear in his playing a vigor, a drive, a great richness in his sonority. As he works his way through the Bach, you hear, as with other great virtuosi, the improvisatory element in his interpretation. What a perfect influence for Hawkins, because you're dealing with two solo instruments, the cello and the saxophone. "Of course, the problem that Hawkins had was on the cello, you can play double and triple stops and get some chordal feeling that can't be had on a single-note instrument like the saxophone. But Hawkins had this drive to get past the single note, and the way he did it, and brilliantly so, was by arpeggiations and chordal runs. Plus, there was his impatience with the bar line. "Casals and Hawkins had the same kind of musical temperament. Playing the Bach solo pieces, Casals would dive into a low note with a breadth and tremendous vigor matched be few cellists. And in fact, Harry Lim talked about meeting Hawkins in Europe, and how excited Hawkins was by a recording of Schubert's Opus 99 by the Cortot-Thibaud-Casals trio. "Also, Hawk was obsessed with vocal music, especially opera. He had a huge record collection, most of it classical. Very little jazz." Additionally, here are the more interesting pages referencing Casals from John Chilton's "The Song of Hawk: The Life and Recordings of Coleman Hawkins": (BTW, flip up to page 354 for Hawkins' hi-fi set-up.) Unfortunately, the "Retrospective" does not contain Hawk's magnificent solo tour de force "Picasso" (available on "The Jazz Scene" [Polygram Verve 1994]) that Chilton compares to Casals' Bach and Joyce's "Finnegan's Wake" intriguingly: what food for thought! (The references to opera reminded me of Miles Davis' love of Price's/Karajan's "Tosca" Decca LPs that he repeatedly wore out and desired to remake with Gil Evans. Sadly, it never happened. (The tantalizing Tosca/Stockhausen/James Brown troika can be heard on Miles' amazing "On the Corner" complete sessions box (or at least the Stockhausen/JB duo can) (OAOP has already covered Markus Stockhausen's connection to Miles. My header image was taken from the 2008 post In search of Pablo Casals which takes me down another fascinating overgrown path. Previous posts have explored the links between Casals, who lived in exile in Prades in French Catalonia, and author, peace activist and Trappist monk Thomas Merton, who was born in Prades. Jazz was one of Merton's great passions and there are a number of references to this in the definitive biography The Seven Mountains of Thomas Merton by Michael Mott. In one reference the book tells how when a schoolboy at Oakham School Thomas Merton visited Paris in 1946 and wrote enthusiastically in the school magazine about hearing Josephine Baker sing "J'ai deux amours, mon pays et Paris." Coleman Hawkins, who is seen in my footer image, had been in Paris before the outbreak of war and the musicians he worked with there included Django Reinhardt and Benny Carter. More on Casals' and Merton's shared love for mon pays Catalonia here and you can hear Casals' orchestral Bach, complete with instrument of the moment - the saxophone, together with a setting of Merton's poetry in my musical homage to that magical region here. The excerpt from the interview quoted above begins, "In the late Twenties, Casals had begun to record some of the Bach solo pieces as well as a great variety of other material, from lightweight to esoteric." 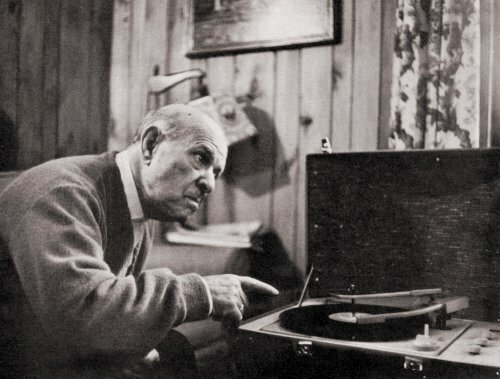 Casals recorded no solo Bach between April 1916 and late 1936, when he embarked on his set of the Suites for HMV. As for the other material he recorded in the late 1920s, most of it was standard lightweight cello bon-bon repertoire; none of it was remotely esoteric then (now it might be, only because such repertoire has disappeared from concerts and records). The connection you seek to establish is not surprising at all: Casals was a globally famous musician and his records of the cello suites were very well known.